You don’t need to travel all the way to Congo to see okapi. Kids and adults will love visiting our okapi here in Bristol and learning all about them in our Secret Congo. Okapi are elusive forest-dwellers that are only found in parts of the Congo - they are one of the last large land mammals to be discovered! The Okapi has short, dense, velvety fur and striped bottoms with a long neck and a black, elongated prehensile tongue like its closest relative, the giraffe. The okapi tongue is about 35 cm in length and long enough for the okapi to lick its own eyelids as part of its fastidious grooming. The male also has skin-covered horns like a giraffe, however, unlike a giraffe, the neck is much shorter. Okapis stand about 170 cm tall and while the male weighs about 230 kg the female can weigh over 300kg. Their long necks and flexible tongue allow the Okapi to feed on tree leaves and buds, which they strip off the branches with their tongue just like giraffe, their closest relatives, do. The solitary okapi lives in large secluded, high canopy forests without too dense foliage. Okapi are classified as endangered, mainly due to habitat loss and poaching. You can learn more about the okapi's conservation status on the IUCN Red List of Threatened Species website. 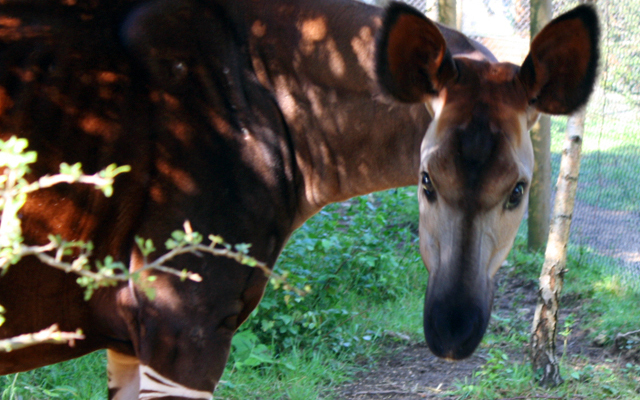 Did you know that you can get up-close to our okapi by doing an okapi experience? Find out more here.